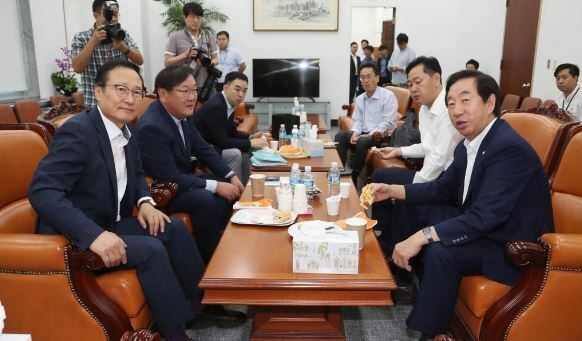 The floor leaders of rival parties held a closed-door meeting Tuesday to discuss how to handle key bills on bank deregulation and the economy at the ongoing extraordinary parliamentary session. The parties earlier agreed to deal with bills on deregulating Internet-only bank ownership and protecting tenants at commercial buildings at a plenary session slated for Thursday. But their negotiations hit a snag as they differed on details. A parliamentary subcommittee reviewed bills on easing nonfinancial firms' ownership cap of 4 percent for web-only banks. But lawmakers differed on the scope of the limit and how to define nonfinancial companies subject to the envisioned deregulation. The ruling Democratic Party wants to enact a special law that calls for boosting the ownership cap in Internet-only banks to 25-34 percent. But the main opposition Liberty Korea Party proposed a revised bill to boost the ceiling to 50 percent. It is also unclear whether the parties could narrow differences over the proposal to protect tenants at commercial buildings. The parties earlier agreed in principle to enact a law revision to better protect such tenants in an effort to support small, self-employed businesses hit hard by a slumping economy and recent minimum wage hikes.